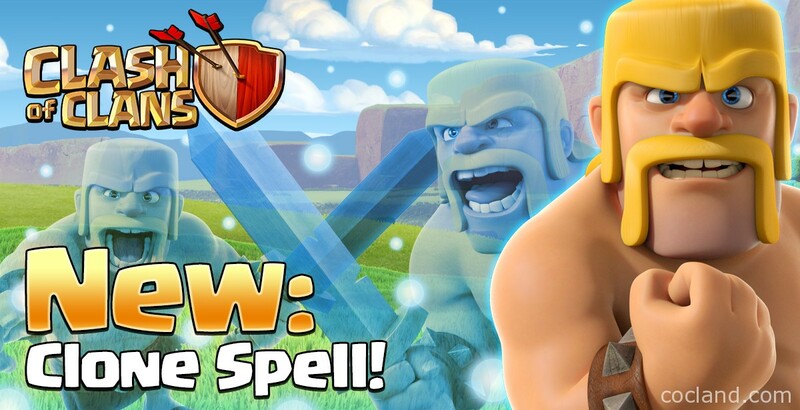 Clone Spell is the new Spell which was released in the Clash of Clans May update, a few weeks ago. This new stunning spell has a special ability that copies every single troop coming through the circle. Let’s take a look for more details my friends! You can turn the Clone Spell into an army to create a circle of spawning. This circle will create limited-lifetime illusions of troops troops that enter the circle. The cloned troops are just the same as the real ones but blue and look like glass. They have the same damage, HP, movement speed,… but have limited lifetime! You can’t clone Heroes by using this spell! The copied troop levels = the original troop levels. The copied troops can only last a limited amount of time and it is 15s. Summoned units of Cloned Witchs/Golems/Lava Hounds will be also in the cloned status. Clone Spell can also easily clone sub-troops and even the Skeleton Spell’s Skeletons. Spawned troops from Heroes can be cloned by this spell. Only level 3 and above Clone Spell can clone Golem, P.E.K.K.A and Lava Hound. Okay so most of you guys are asking how to use this spell effectively, right? The Clone Spell is the most expensive Spell in game as it takes 4 spell housing spaces. I have been using this spell for couples of days and personally I found that the best way to use it is to place it inside the core. This is because our copied troops last for 15 seconds and I need them to deal with the core, where you have lots of problems while dealing with. This spell will give you additional DPS and HP to deal with all defensive buildings nearby easier. You will want to force the defensive buildings to attack the copied troops first, right? That’s why you should drop this spell a little in front of your main army, that way your cloned troops will always be in front of the main ones. If you drop the spell right on top of your army, defenses will target your original troops instead of the cloned ones. Which troops should I use the Clone Spell with? Balloons: Nowadays, with the buff of air troops, Balloon becomes pretty popular. If you are a fan of this guy, you definitely should give this spell a try! Remember when you have just a few Balloons in the core and the Freeze Spell couldn’t help you much? Use a Clone Spell to get up to 7 more Balloons! This will change lots of things. Barbarian King: No! We are not going to copy the Barbarian King! We can’t! But, If your King is inside the core and he and his Barbarians can’t take down the Town Hall, drop the Clone Spell, activate his ability and you will get up to 35 raged Barbarians. This is awesome! Valkyries: Hands down, we all can easily see that how incredible it is If you can get up to 5 more Valkyrie helping you break inside the core. Also, after the update, it’s also a good choice to clone Bowlers as their housing space cost was decreased a lot! And I almost forgot, upgrade your Clone Spell to at least level 3 before using it, otherwise it’s not really worth it at all!